The TO&A Diamond View business center offers a uniquely prestigious downtown San Diego business address that overlooks the home of the Padres baseball team, San Diego Bay and the Pacific Ocean. We offer fully furnished conference rooms equipped with state of the art audiovisual technology, LCD projectors and high speed internet. Our highly skilled onsite staff is ready to assist you with any professional and administrative support you may need. TO&A can provide all your deposition needs from court reporters, interpreting, and videography. 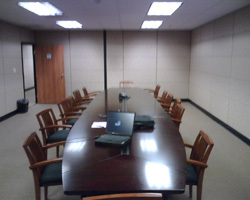 This deposition suite is located near the 5 freeway. The San Diego International Airport is only a 15-minute drive away.